It's been a good 24 hours to be a Marvel fan. The Web was invigorated yesterday with the first images of Spider-Man and Captain America as they will appear in new films, and we're excited to begin the weekend with an astonishingly cool new photograph of Chris Hemsworth as Thor. 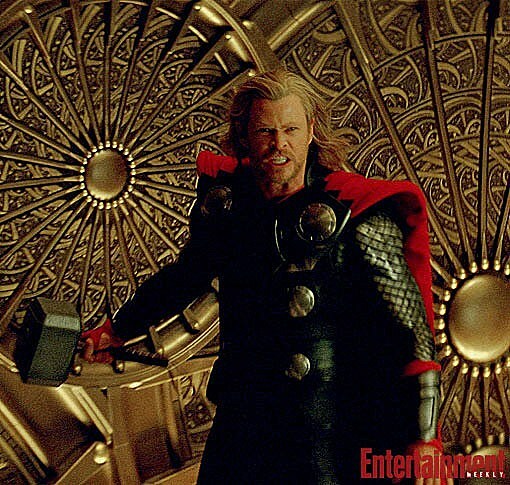 Directed by Kenneth Branagh, Thor becomes increasingly anticipated by we at ComicsAlliance, as each new image and piece of footage suggests what is likely to be the most epic and over-the-top of Marvel Studios' superhero movies. Check after the jump for the full image, which comes courtesy of Entertainment Weekly and photographer Zade Rosenthal. Also starring Anthony Hopkins, Idris Elba, Rene Russo, Stellan Skarsgard, Jaime Alexander, Ray Stevenson and Kat Dennings, Thor opens May 6.